This for me is one of the most difficult letters I will ever have to write. 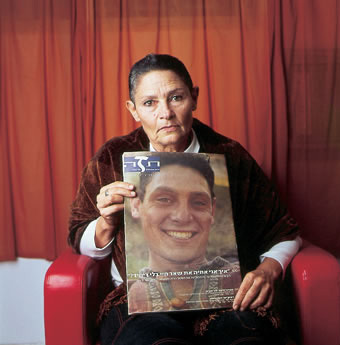 My name is Robi Damelin, I am the mother of David who was killed by your son. I know he did not kill David because he was David, if he had known him he could never have done such a thing. David was 28 years old, he was a student at Tel-Aviv University doing his masters in the Philosophy of Education, David was part of the peace movement and did not want to serve in the occupied territories. He had a compassion for all people and understood the suffering of the Palestinians, he treated all around him with dignity. David was part of the movement of the Officers who did not want to serve in the occupied territories but nevertheless for many reasons he went to serve when he was called to the reserves. What makes our children do what they do? They not understand the pain they are causing your son by now having to be in jail for many years and mine who I will never be able to hold and see again or see him married, or have a grandchild from him. I can not describe to you the pain I feel since his death and the pain of his brother and girlfriend, and all who knew and loved him. All my life I have spent working for causes of co-existence, both in South Africa and here. After David was killed I started to look for a way to prevent other families both Israeli and Palestinian from suffering this dreadful loss. I was looking for a way to stop the cycle of violence, nothing for me is more sacred than human life, no revenge or hatred can ever bring my child back. After a year, I closed my office and joined the Parents Circle – Families Forum. We are a group of Israeli and Palestinian families who have all lost an immediate family member in the conflict. We are looking for ways to create a dialogue with a long term vision of reconciliation. I understand that your son is considered a hero by many of the Palestinian people, he is considered to be a freedom fighter, fighting for justice and for an independent viable Palestinian state, but I also feel that if he understood that taking the life of another may not be the way and that if he understood the consequences of his act, he could see that a non-violent solution is the only way for both nations to live together in peace. I can only imagine what it took for you to write this letter, Robi. I hope the mother you wrote it to will be able to respond in kind. You are a real heroine, and I pray this letter will be read by many, and that it will give you some peace. It’s a beautiful letter. Unfortunately the response from Ta’er Hamad is far from beautiful.